1盎司2016年超人™ | S-盾牌银币 | ?? 1盎司2016年超人™ | S-盾牌银币 Best pricing on the Superman™ S-Shield 1 oz bullion silver coin, with limited mintage of only 1 million coins and collectible quality tubes and monster boxes. Superman™ is the world's most beloved superhero. Since first appearing in 1938, his drive for truth and justice have inspired millions. 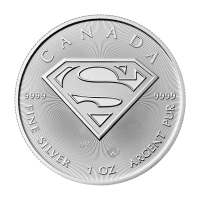 The iconic S-Shield on the chest of his superhero costume is recognized world wide, and is now featured on the Royal Canadian Mint's latest bullion silver coin release. The coin has premium frosting, which is very unusual on a bullion coin. It also features all of the latest security features, including light diffracting radial lines and a micro-engraved maple leaf featuring the year of production. The Royal Canadian Mint has really stepped up their game with the packaging for this coin, and we think the tubes and boxes will become collector's items in their own right! Individual tubes of 25 feature a red lid matching the colour on Superman's™ cape and boots. Monster boxes of 500 have a blue bottom with a red lid, again with the shades matching Superman's™ costume. The box also features collector quality labeling that is a must have! Limited mintage of only 1 million coins mean that this coin will always be highly liquid and sought after. Order yours today because we expect them to sell out faster than a speeding bullet!